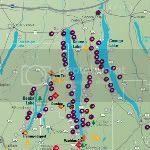 This week, it’s all about the food and wine of the Finger Lakes Wine Country, just a few hours north of New York City. I attended a tasting at New York’s Astor Center, the state of the art tasting room above Astor Wines, where I got a chance to taste a number of Rieslings from the Finger Lakes paired with nibbles prepared by some of the region’s best chefs. In addition, we learned about many of the fun activities on offer in the region, from sporting, to car racing, and of course, the heritage museums of Central New York.